Clever, quick and irrepressible, Rosamund soon becomes the darling of the haute ton, and presides over her luxurious chocolate house where the rich go to be seen and indulge in their favourite pastime, drinking the sweet and heady drink to which they've become oddly addicted. Karen Brooks is the author of twelve books, an academic of more than twenty years' experience, a newspaper columnist and social commentator, and has appeared regularly on national TV and radio. Before turning to academia, she was an army officer for five years, and prior to that dabbled in acting. She lives in Hobart, Tasmania, in a beautiful stone house with its own marvellous history. When she's not writing, she's helping her husband Stephen in his brewery, Captain Bligh's Ale and Cider, or cooking for family and friends, travelling, cuddling and walking her dogs, stroking her cats, or curled up with a great book and dreaming of more stories. 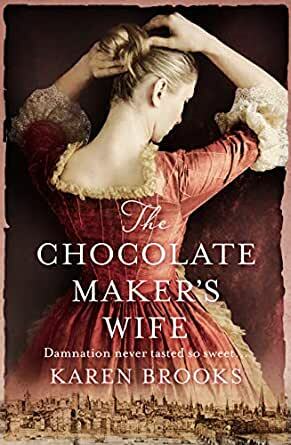 I ENJOYED THE CHOCOLATE MAKER'S WIFE, A BIT SLOW TO START BUT WELL WORTH IT. 3.0 out of 5 starsA vivid, event packed historical novel written from the heart with a lot of passion and research. But that view is based on ‘The Chocolate Maker's Wife’ BEFORE I read the author’s note at the back of the book. That did change my mind a little, as I discovered this was a story from the heart, based on a curiosity turned to passionate research and world building. I really found reading the authors note at the end shone a whole new light on ‘The Chocolate Maker's Wife’ for me. I mean, until that point I was going to give it two stars. Not only because it was not really my sort of genre (which is actually my fault), but as I felt it a little annoying to fit as much into it as possible. It was like: ‘Hey, let’s pick a period of time and shove as much history into our book as we can to make it sell more.” That was the feeling I had… until I read the author’s note. And then I needed to bite my tongue for being such a cow as, judging on said note, that is not the case at all. So, okay, ‘The Chocolate Maker's Wife’ wasn’t exactly my cup of… chocolate, but it wasn’t a terrible book. A lot of love, passion and research have gone into it to spin a vivid, colourful and – I would like to believe – mostly accurate depiction of 17th century London during all these events. I still feel it was crammed a little too full of historical events than actual storyline about the characters… but that is just my opinion. I really would have liked to have seen the plot not have to rely so heavily on all the events to make it a story… if that makes sense? For the technical side of things, I found the formatting rather lacking too. I feel they have only formatted ‘The Chocolate Maker's Wife’ as a print to paper book and didn’t format to suit Kindle, as the paragraphs were all over the place, mid-sentence at times, and very jumbled. I am hoping these issues have been fixed by the final draft – I was reading an ARC after all – but please bear this in mind when choosing which format to purchase it in. This is a tough call for me. I mean, ‘The Chocolate Maker's Wife’ wasn’t exactly for me, but there is a lot of love, detail and creativity put into it. And, being by a fellow Australian author, I feel I would recommend it on those merits alone. But I would have to say that it is a historical novel with a touch of romance and a HEA, more than the historical (fluffy) romance I thought it was going to be. I think we all know the answer to this one – no I wouldn’t. If anything, I would borrow and read it as a library book… maybe. But I really, REALLY want to emphasise that it is not a bad book, it just wasn’t what I was expecting… but hey! I finished reading all of it (including the author’s note) and that shows it had some major positives going for it. But ‘The Chocolate Maker's Wife’ was not the book for me. Good book – poor choice by this reader. The setting for this novel is Restoration London, between 1662 and 1667. London in 1662 is still coming to terms with the return of Charles II to the throne: there’s both frenetic gaiety and puritan sobriety. And by 1667 London will endure both the Great Plague and the Great Fire. Enter Rosamund Tomkins. Born into poverty and treated badly by her mother, step father and step brothers, Rosamund seems condemned to a life of drudgery in her step father’s inn. But an accidental meeting changes the course of her life. Sir Everard Blithman recognises Rosamund as someone to be treasured, strikes a deal and then marries her. Could it be a dream come true? Sir Everard Blithman plans to open a chocolate shop. Rosamund quickly becomes his greatest asset, and the chocolate shop is very popular. But Sir Everard Blithman has secrets, and Rosamund is a pawn in a much bigger game. I enjoyed the way in which Ms Brooks wove her fiction around the history of London at this time. Most of the characters were well drawn, and I especially liked Samuel Pepys’s appearance in the story. A well-crafted story of cruelty and revenge, of loyalty and love. If you enjoy historical fiction set in 17th century Restoration London, you may well enjoy this novel as much as I did. I received a copy of this book via NetGalley and Harlequin Enterprises (Australia) Pty Ltd for an honest and voluntary review.I have not had the pleasure of reading this author's books before and now after reading this book I know I will be going through the long list of her books and reading each and every one. The story of the Heroine, Rosamund Tomkins and her journey from abject poverty to be the wife of a nobleman and to a life of luxury. Her husband, Sir Everard Blithman presides of the luxurious London chocolate house where the wealthy indulge themselves in the exquisite tastes of of Chocolate. This book contains very wonderful and accurate scenes of what London was like in the time of Charles the II and all the contrasts of the poverty stricken to the indulgences of the titled and wealthy and the struggles of the downtrodden to survive plague and fire and starvation. I loved this book and know that it will appeal to many readers as Karen Brooks writing style brings her characters to life and makes them very memorable. I highly recommend this book and author.